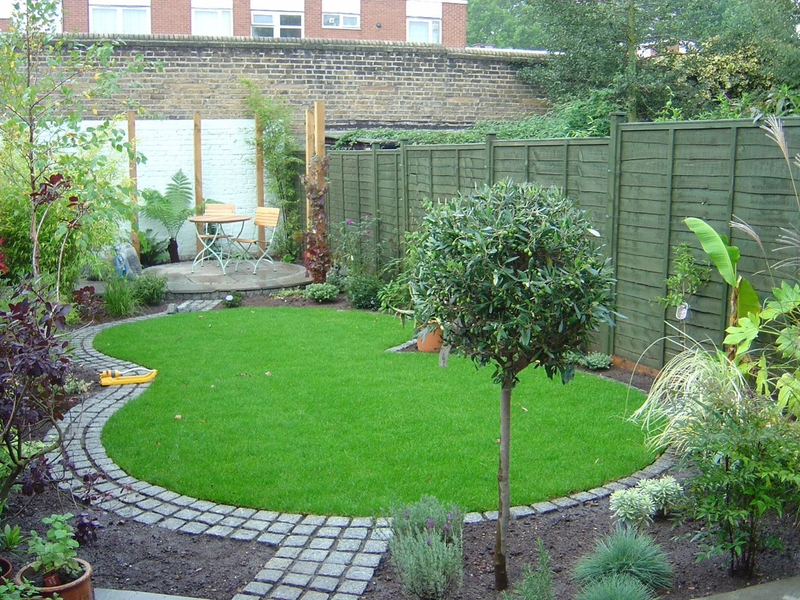 This is a small town garden of a terraced house in Earlsfield, south London. On my first visit the clients told me it had been overgrown with brambles, nettles, ivy and a couple of dead trees, which they had had cleared, but what I saw was now a reasonably clear area with some scrubby grass and a white painted 8’ high brick wall at the end, which they told me was the back of garages in the next street. The Clients had had a preliminary sketch of a design done, which the previous designer had offered to get built, but for a budget far exceeding what they had in mind. The design also needed some development to get the contemporary feel they wanted, but combined with the use of some more traditional materials. They wanted a curvy flowing garden without any straight lines. The initial design took this into account, with a curved path and beds, but the curves were too tight and not really as flowing as the Clients wanted. I set out the basic shape of the original layout with pins and orange twine so they could see what it looked like and then smoothed out the curves to give them the design they were after. I also incorporated an extra small seating area at the far end of the garden which got the morning sun. As they wanted to save some money on the cost of construction they acted as labourers for me during the build, which they found hugely enjoyable and really satisfying as they could say they actually contributed to the build. With it being a terraced property and no rear access all the materials had to come through the house. This involved a number of strategically placed planks to get the wheelbarrow up and down the various steps from front to back and some nimble limbo work going down the stairs from lounge to kitchen to avoid bashing your head on the ceiling. Dust sheets and plastic were put down to protect the carpets and wooden floors along with bubblewrap attached to the lower walls to protect them from scuffing. We also had to contend with an overzealous parking warden who felt it entirely appropriate to put parking tickets on crates of slabs and bags of topsoil – so everything had to be shifted pretty quickly upon its arrival. Once we got into the swing of it, moving the material through the house and piling it up in the garden worked quite easily – we just had to make sure we didn’t order too much at once so we didn’t run out of space! The build went really well and fairly soon the hard landscaping of paths and patios was completed and the first shoots of a garden were breaking out from the previous scrubby mess. Bags of topsoil and compost soon followed on the now familiar trip through hallway, lounge and kitchen, closely followed by a lorry load of small trees, large shrubs and a selection of perennials. The final element was a lovely green carpet of lawn to complete the job. All the rubbish was removed from site, before taking up all the protective coverings and leaving the house as it was at the start of the work. I left behind a pair of very happy Clients looking forward to their Saturday morning coffee and croissants on the patio at the far end of the garden and an evening barbecue on the one adjacent to the house, whilst enjoying the last of the evening sunshine. 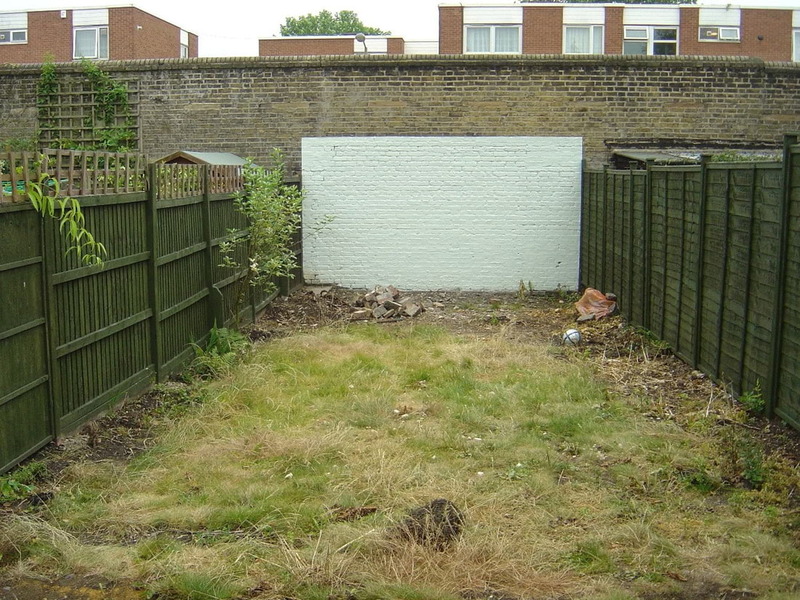 If you have a terraced house with no other access and are a bit concerned about whether you can have a lovely garden – the answer is yes you can! And you don’t have to help build it – we’ll do the design and build it all for you, so please get in touch.